That is why I had bookmarked Anne’s wheat free oat muffins. They had oats in them but there’s a catch. They only have oats in them. No wheat flour, only oat flour. When I saw the recipe, it captured my attention because I have never tried to bake with oat flour only. Nor have I tried to replace eggs with ground flax seeds. Would the muffins turn out too nutty? too crumbly?and without eggs and so little fat would they be too dry?I had to try them to find out. I used Anne’s recipe with a few modifications.I added dates, cinnamon, cardamom and walnuts to the recipe. Replaced the molasses with date puree and increased the amount a little. Evenly divide the dough into 9 portions in a greased muffin tin. Bake for 25 minutes at 350F. You can replace the ground flax seeds with ground chia seeds. If you do not wish to make these vegan. Replace the flaxseed water mixture with 1 egg and use regular milk. These muffins are completely customizable, if you don’t like dates you can replace them with cranberries, raisins or omit them all together. 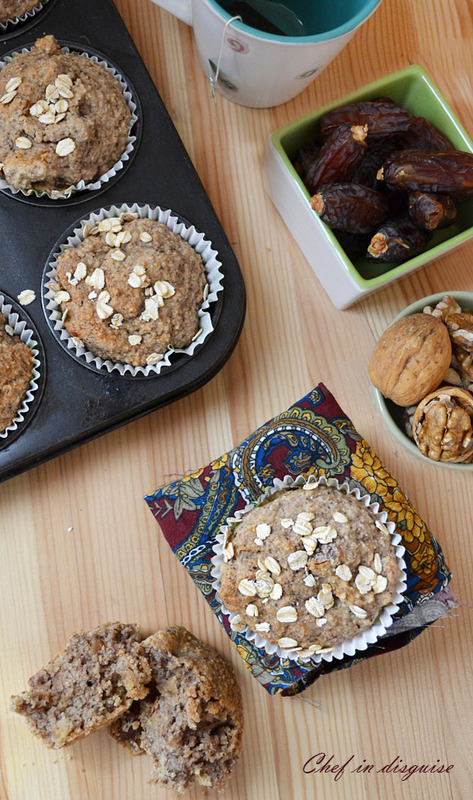 Use your favorite nuts or make the muffins plain without any additions. Play around with sweeteners, honey, molasses, date pure, maple syrup or brown sugar.Each will have its own flavor profile, experiment and find your favorite. 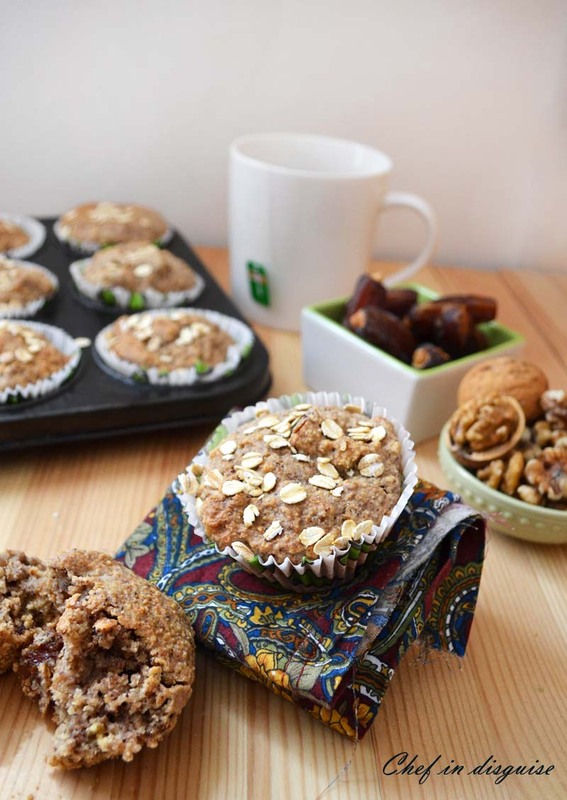 Posted in Breakfast, Dessert, vegan and tagged baking, breakfast, ground flax seeds, healthy breakfast ideas, how do I replace eggs with flaxseeds?, oat flour, oatmeal muffins, postaweek, using flaxseeds to replace eggs, vegan cupcakes, vegan dessert, vegan pancakes, walnut muffins, wheat free muffins. Bookmark the permalink. These look gorgeous Sawsan. Love that they contain coconut milk. I was only this morning discussing the health benefits of oatmeal. My grandma in Holland is about to turn 104 and she has had oatmeal porridge almost every morning of her life! She is a (long) living advertisement for oatmeal. PS. Your vegan pancakes look excellent too. You know Sawsan, I have read a lot about the flax seed substitute for eggs..because a lot of people in India dont eat eggs,..so its always good to know a good substitute. and since it worked so fantastically in this recipe.. am convinced to give it a try!! These would make excellent breakfast muffins!! Yummy. Those look wholesome and tasty. Perfect for breakfast. I’d love to eat those sweet and juicy dates in the picture, too! I’ve only recently began liking oatmeal and it’s not only addictive but also versatile, so many things can be done. Your muffins look beautiful. I have been hearing a lot of about flax seeds being egg substitute, and that looks very interesting because much as I dislike that ingredient, I would love to incorporate it in my cooking. Awesome muffins Sawsan! oatmeal, dates, and walnuts?! Sounds like an AMAZING combination! Love it! Very healthy muffins. I have not incorporated flax seeds into our diet yet, but just bought some yesterday without knowing what I’ll make. This is a great recipe to get started. These look wonderful! How fun that they contain oat flour – I’ve never worked with that. Sounds truly wonderful – thanks for this. Love the look of this vegan recipe! Your healthy, nutritious muffins are making my eyes twinkle. A lot. Me again, I’m just reading an India recipe with Gram flour . New fact to me , gram flour mixed with equal amount of water can be use as an egg substitute in vegan cooking . Maybe it will work in the muffins. I like how it calls for oatmeal only , never tried it before. Thanks Sawsan, you have inspired me to try it too. These look delightfully healthy and I think you have made some wise additions to the recipe to make them even more delicious. can i made it by blended regular oats??? I loved working with oat flour. I’m glad you pointed out that they are not dry and crumbly Sawsan, as I was reading the ingredient list I thought they might be, but then the coconut milk would add a reasonable amount to richness. I’m really liking this muffin! I will try it for sure.